Successfully Added Police Body Cam - IP65 Waterproof, Night Vision, 1296p Resolution, Time Stamp, 2 Inch Display, 140 Degree Lens, 32GB Memory to your Shopping Cart. If you are looking for a high-end security gadget, this professional police body camera is the ultimate electronic for you. 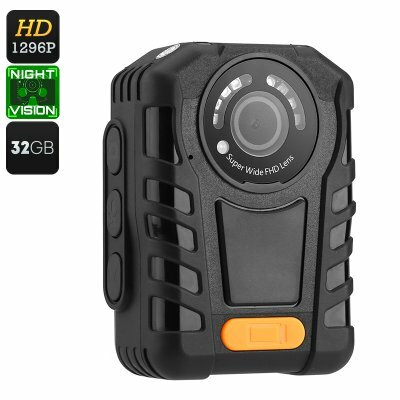 This body cam is perfect for private security guards and bouncers as it will record everything that’s happening in front of you throughout your shift in crisp 1296p resolution. The body camera has a compact size and can be easily attached to your clothes or belt. Additionally, it is IP65 waterproof, meaning that you’ll be able to use it outside no matter the weather conditions. Equipped with a powerful 5MP CMOS sensor, this body worn camera produces detailed Full-HD video as well as stunning 32MP pictures. With its 140-degree viewing angle, nothing will stay uncaptured when you’re equipped with this police body camera. This body cam features a powerful 2900mAh battery thanks to which it allows you to record up to 10 hours of footage in a row. It furthermore packs 8 IR LEDs that supports up to 15M ultra-clear night vision. This means that this body camera allows you to shoot recognizable footage at both day and night. No matter the time of the day, this powerful police body camera will get you through the longest and toughest of shifts without needing to worry about running out of juice anytime soon. This body worn camera has been equipped with a sophisticated 2-Inch LCD display on which it allows you to instantly watch back all your previous recordings. The body cam furthermore comes with a built-in microphone that records high-resolution audio along with all video material. Guaranteeing that even the slightest detail will be captured, this police body camera supports a 16x digital zoom option thanks to which it allows you to capture high-end and recognizable footage even from afar. With its 23GB of internal storage, it is guaranteed to pack enough space to securely save all your footage made throughout your upcoming shifts. When equipped with this amazing body worn camera, you and your colleagues are guaranteed to never be bothered again with false accusations or legal claims with respect to little disputes that took place during your working time. The body cam furthermore allows you to attach a watermark, user ID, time, and date stamp to all your videos which is perfect for further security purposes. This police body cam comes with a 12 months warranty, brought to you by the leader in electronic devices as well as wholesale electronic gadgets..
Arabic: - كاميرا الهيئة - Chinese Simplified: - 身体的相机 - Czech: - Tělo fotoaparátu - Danish: - Body kamera - Dutch: - Lichaam Camera - French: - Corps de caméra - German: - Körper-Kamera - Hebrew: - גוף המצלמה - Hindi: - शरीर कैमरा - Italian: - Corpo fotocamera - Japanese: - 本体カメラ - Korean: - 바디 카메라 - Malay: - Badan kamera - Norwegian Bokmål: - Kroppen kamera - Romanian: - Corp aparat de fotografiat - Russian: - Тело камеры - Spanish: - Cuerpo cámara - Thai: - กล้อง - Turkish: - Vücut kamera - Vietnamese: - Máy ảnh cơ thể.